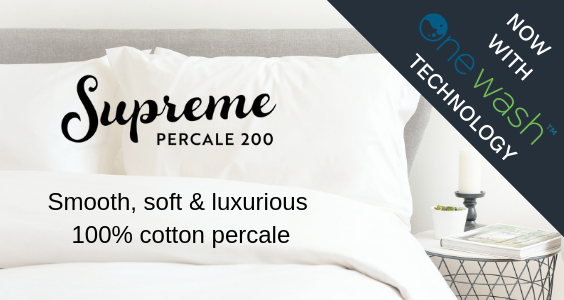 After months of rigorous research and development, Tonrose is delighted to announce that their luxury 100% cotton 200 thread count percale linen now features the innovative One washTM technology! Extending the existing range that was launched last November, the latest product launch is set to prove popular with upmarket chain hotels, B&Bs and boutiques. In a competitive industry where customer is king, the finer details can make or break the success of any hospitality establishment. Customers expect smooth, crisp. crease free linen. Previously, new cotton bed linen has required five, or even six, washes to completely remove residual sizing to avoid excessive or cracked-ice creasing. This has affected the appearance and handle of the linen, as well as being a drain on budgets and resources for laundries and end users. With a tendency for blockages and proneness to creasing due the fineness of the weave, cotton percale products have earned a reputation as being difficult to launder across the industry. The difficulties are further enhanced when sizing remains after the first cycle. 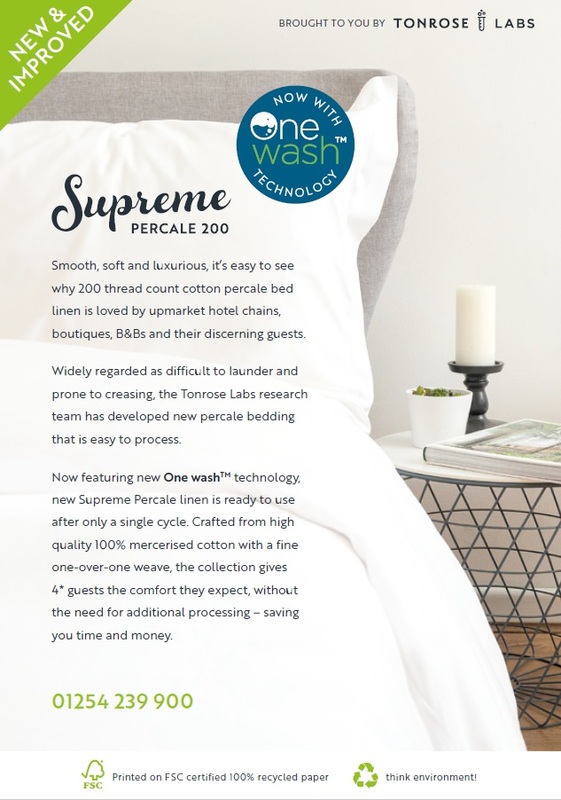 To solve this dilemma, Tonrose Labs research team has developed a new percale bedding which is easy to process and is ready for use after a single wash and ironing cycle. Building on the success of the first One washTM product, Tonrose is excited by the real savings for laundries and hotels both in time and money. Phil Hodgson, Commercial Director at Tonrose, commented, “The market was really responsive when we launched One wash as they could see the tangible benefits. We decided to prove the technology with our most popular 70/30 blended linen first as this is the most widely used across the industry. But what we have found is that customers have been aching for the technology to be applied to the luxury cotton percale products most as these are the most difficult to process. Tonrose is built on a foundation of three key ethical principles – product, people and environment. The company prides itself on the stringent measures to ensure the welfare of people within its textile suppliers, such as a zero tolerance to child labour, and contributes to the local communities through humanitarian projects such as The Citizens Foundation. Innovation is another important aspect for Tonrose, which helps customers get the most out of their linen products and minimise their environmental impact. Improvements to existing lines, such as applying One wash technology to bed linen assists with both these elements. Linen can be in circulation longer as it hasn’t wasted a significant part of its life in multiple washes before it can even be used (to remove the sizing). Fewer re-washes means less water, less energy and fewer impurities – having both a positive effect on the bottom line, and the CSR commitments.